Selections from a book in progress. Known for its incredible music programs, Texas is home to some of the largest and smallest bands in the world. These competing programs, not unlike the legendary David and Goliath, must regularly prove their worth in order to remain relevant and respected. Both have unique strengths, whether it is their size or perseverance that aids them in their pursuit of high musical honors. This article will attempt to compare the teaching philosophies and obstacles in award-winning bands of varying sizes. Much like the giant, “Goliath,” there are bands in Texas who tower above all others with hundreds of students across multiple campuses, multiple assistants, and an impressive annual budget. These programs have enormous Band Booster Associations, private lesson teachers, and often function in multi-high school districts. These qualities can all be a positive but also require an enormous amount of management and upkeep. Bands of this size cannot succeed without a supportive community, student help, and directors who are experienced, calm, and extremely organized. The smaller bands in Texas, “David,” are generally made up of less than 300 total students from 6th to 12th grade. Directors at small schools are often facilitators of the district’s only music program (sometimes the only fine arts credit) and decades of school tradition. These directors must deal with an immense amount of student-sharing with other activities (like football or agriculture), limited community assistance, and often outdated facilities. Because these programs are often taught entirely by three directors or fewer, it is imperative that the individuals chosen for these roles are experienced, resourceful, and capable of teaching both middle school and high school aged students. Size is frequently used to measure a band’s success. It’s easy to say that because one program is larger than the other, they are more successful. This is not always the case. In reality, to compare the enrollment of a band from a 6A and a 1A school, one should use the school’s total population to calculate the percentage of students who willingly participate in the band. Perhaps the 6A has a larger number of students than the 1A, but a smaller percentage of the total school population. In this way, we can more accurately determine that particular program’s popularity in their community. Based on the size of the band program, some directors must ask themselves whether or not the 7th or 8th grade students should be included in the High School contest band. This will seem ridiculous to others, since seventh grade students are usually only in their second year of musical instruction, but it is important to note that David schools often do not have the instrumentation to perform with a purely high school group. After beginner band, students will either attend UIL with the varsity group, or are not in band at all. The enormous range of maturity of sound and performance experience have an enormous impact on the program’s success. In larger school districts, students must compete for spots in the varsity band. This allows Goliath directors to isolate their best players (in both attitude and skill) in order to achieve the highest musical honors possible. This separation of high school ensembles also allows for ineligible students to be replaced more easily before contest. However, the downside of having a greater number of students in Goliath programs is that a greater number of directors, private lesson teachers, teaching spaces, and funds are also necessary for success. Goliath directors must work together to organize and teach a beginner band, a 7th grade ensemble, an 8th grade ensemble, at least one high school band, and at times a jazz band or orchestra as well. Rather than comparing class enrollment, the better size-related questions directors should ask themselves are whether their retention rate is acceptable, whether the parts are all covered, and whether there are enough instruments and spots on the field. How do the teaching philosophies differ? The most striking difference in teaching philosophy between larger and smaller programs is most definitely the importance of each student individually. In a Goliath band hall, the sheer number of students can make it challenging for directors to view each individual student as a unique project. More often, the students who receive the most attention are those at either end of the spectrum; the best and worst in both behavior and playing. This is not that different from the issues a David director might face, except that in a very small band program, cutting students is often not an option due to a lack of numbers or band being a required credit. Regardless of population, band directors of all classifications must strive to find a balanced band sound. In a very small program with perhaps ten students or less on each instrument, every individual makes up at least 10% of that tone color. Ignoring the bottom few players of each section or drastically cutting down parts is often not an option since every voice is needed to make the ensemble sound balanced. On the opposite end of the spectrum, in a program with up to fifty students on an instrument, each student represents less than 2% of their section’s overall sound. The importance of the individual player is therefore diminished and the challenge then becomes making fifty clarinets sound like ten. 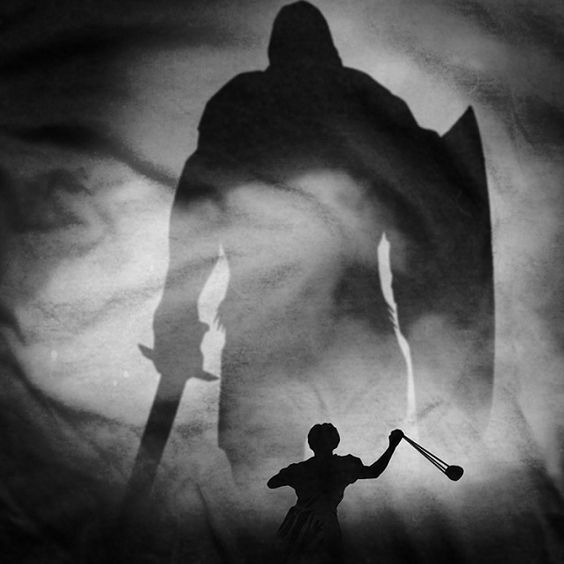 Whether you are the towering giant or the petite warrior, no band directing job is without its challenges or victories; they are often just on a different scale. The most important aspect of the job is sharing a love of music with students and ensuring that the band programs continue to grow and succeed; educators can rest assured that the grass is exactly the same shade of green on every practice field.